After months of leaks, rumors and speculation, Apple (s aapl) introduced a smaller version of its popular iPad tablet starting at $329 on Tuesday. The iPad mini is a 7.9-inch tablet that runs the same iOS software as Apple’s other mobile devices but can easily be held in one hand. The device is available for pre-order on Oct. 26 and is expected to arrive in customer hands and Apple retail stores on Nov. 2. Prior to the product launch, Apple CEO Tim Cook, noted that Apple has sold 100 million iPads to date. There’s still room in the market for a smaller device, however, which is where the iPad mini fits in at 7.2 millimeters thin and 0.68 pounds. All of the existing iPad software works on the iPad mini — including the new iBooks 3 app — which uses the same 1024 x 768 resolution as the original iPad model. The new model should be more portable; something I noted last January about smaller tablets. Phil Schiller showed off the new iPad mini in a head-to-head comparison with Google’s(s goog) flagship tablet, the Nexus 7. Most of the presentation illustrated how iOS shows more information on the browser — up to 49 percent more — and in apps due to Android’s need for on-screen controls. Schiller explained the iPad Mini uses a dual-core Apple A5 chip, comes in Wi-Fi and LTE models, has a 720p iSight camera on the front and 5 megapixel camera on the back. Battery life is 10 hours. A new Smart Cover is also available as an option for iPad mini. The base $329 product is a Wi-Fi model with 16 GB of storage. Adding LTE support is costs $130 more and storage can be boosted to 32 GB or 64 GB for $100 per optional increase. Has the tech world lost its objective when it comes to Apple technology? This week there was a hidden egg in the Apple iPad mini announcement… iPad 4. It seems that some people are defending Apple’s decision to devalue the iPad 3… With the argument that, its the fast pace of technology. When one pays a premium, they want the “apple experience” and also knowing that they have the latest technology. It has upset the group that recommend technology to non-techies. I was never an Apple-head or a PC-head. I just love great technology. But when Apple said “screw you” it has lost my future sales and my recommendation. For the people who will defend apple… I say, you’ve sold your soul. For the people who love technology, it’s time for us to exercise our influence and start spreading the news that there is life after Apple. My problem with the mini is 512 cashe. Screen quality, both under nexus 7. And a higher price? I will not be buying one. Within 6 months Apple will have no choice but to upgrade the mini. A major disappointment from a longterm Apple fan. I have a Nexus and like it a lot. And it does fit in my back pocket. One of the best things is how it blows up an article to fill the screen. The price is to high and the screen to big in my opinion. If Steve had been here, he would have said ” where’s the cool factor”. Remember him pulling out the nano from his smallest jean pocket! I am not a programmer but can create web applications in minutes using Snappii web service. Such apps are easy to update and besides I don’t have to join Apple or Google Developer Programs (that saves me money) and this way I avoid app review process which saves my time. I advice all to try it. 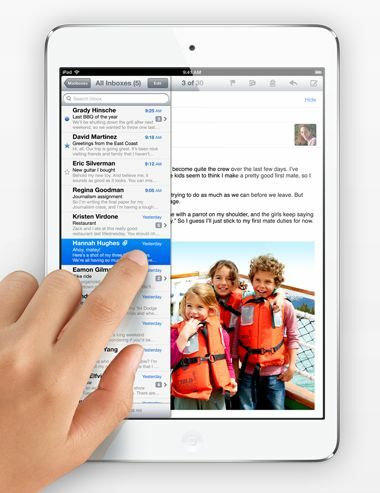 “What was all the hubbub about over the Apple (AAPL) iPad Mini’s pricing of $329? I am talking about its base 16 gigabyte model. I guess that traders and analysts expected the pricing to come in at $299 in order to be somewhat more competitive with Amazon (AMZN) Kindle’s price tags. Which Kindle is the Mini supposed to compete with? The 7 inch Fire HD model for $199 or the Fire HD 8.9 inch which sells for $299? I am sticking with wi-fi only models for comparison. The Mini has a 7.9 inch screen and the iPad4 has a 9.7 inch screen. I would guess that we have to compare the 7 inch fire with the 7.9 inch Mini, So let me get this straightâ€¦ the expected price of $299 was to be highly competitive with $199 in the minds of analysts and traders? I was waiting for it to announce it so I could decide between this and Google Nexus. Now I think I will go with Google Nexus as they have priced it too expensive for a 7 inch device. I was expecting it to be less than $300. It’s really an 8″ device. Don’t get me wrong, I don’t much care for iPads. Just wanted to put in perspective. My Samsung galaxy tab 7.7 is well 7.7. Real estate on almost 8″ is a real welcomed advantage. I absolutely love the iPad MIni, although its price is a bit more as compared to other tablets with the same specs. This is pretty much fail out of the gate, but oddly enough it will probably sell a lot. I think iOS is coming to an end as a niche OS, it’s served its purpose of propelling the tech world into tablets, but now that Windows 8 is here we can finally get around to a “real” OS on a tablet. Similar to the larger ipad the OS is what is the main downfall of the mini iPad (ignoring the terrible screen resolution and price that is). It seems that running out of OS ideas years ago now they are running out of hardware ideas as well. And you also believe the sun rises in the West. Hey, thanks for your enlightened well documented response, I’ll be sure to send it out to a scientific journal immediately. I think they incorporated too much feeling into the making.. So does the 7.9″ tablet pass your portability test (i.e., fit into your back pocket) Kevin? I really hope this spurs Google to add fullscreen mode to Chrome. The stock ICS browser had a couple of really nice lab features on it, of which was was fullscreen (the other was a really nice thumb controls option). As the Apple event showcased, the notification bar, tab bar, and bottom soft navigation really take up a decent bit of space in total. $329 is a smart price for Apple. It is just on the edge of too much, but not over it (imo, the sweet spot for Apple in general). All in all, I can’t wait to see how Apple’s entry into the 7″ market shakes things up for Google and the other OEMs. Hey, where is your review of the Galaxy Note 2? In progress to be pubbed this week. Thanks! Will it fit in a jacket pocket (for those who spend most of their time in climates where a jacket is worn quite frequently)? I seem to recall Jean-Louis GassÃ© had blogged something about how he could envision a future iPad Mini would be nice to slip into his jacket / coat pocket (that’s fine Jean-Louis if you live in such a place where you wear jackets a lot but for those of us in places like Honolulu, there’s no way an iPad Mini is going to fit into any pocket let alone attached to my surf board). At the rumor of $249 I was tempted to try buying it. Now I am sure i will rather order Nexus 7 as my additional smaller tablet.